While i admire his gesture but shame on the establishment. Till such time a govt stayes indifferent to its soldiers.....nothing will work. Today fauz stands disgraced...thanks to our own senior officers. I wont blame babus and govt. Its they who have failed us due to their shortsightedness, self serving attitutde and lack of balls. When our jawans call us names here that means something is wrong some where. No body will give us respect if we dont deserve it....Thanks Mr savani. Dev; where is ex Chief who spend his entire tenure as Chief fighting only to correct his date of birth! last he was seen with MODI JI at REWARI rally,with both promising at the top of their voice,to undo bias towards services and to restore soldier/veteren's status/dignity on assuming power at CENTRE.Not to be seen/heard now.Must be working very hard after becoming MP/MINISTER to fulfil his solemn promise to the Veterans! We veterans are orphans. Only Industrialists may come forawrd to help the family of departed heros.Modi and Arun Jaitley government is very poor. I thank Mahesh Bhai Savani for the great gesture he made and for his undertaking. Great,thank you very much sir on behalf of veterens.Govt never calls us vetetens please remember. We veterans are really proud of Mr. Mahesh Bhai Savani. Great Sir. May god bless you with good health, wealth and prosperity. A true familyman who felt the ground reality and came forward as his name is MB SEVA ni where seva comes first. My 87 yr old mother blesses you. Respect. Perhaps this is happend first time in India. Who took such a huge responsibility of eighten vir saheeds kids education.Politician must learn this.Really a great gesture and dedication to armd forces.Long live for the best cause.Salute n thank u Mr Mahesh Bhai Savani.Great job. No, in Dec 2015 he taken care of a mass marriage ceremony of 151 couples. He spent Rs 1 Lac to each bride, coming from poor background putting himself in 'father' place. I am ex havildar. I apricots Mahesh Bhai Savani matured soldiers childrens education expense. All ex servicemen thanks to you sir. I can only say that you are a messenger of THE GOD, May The God Bless you ! When an Indian soldier becomes martyr same times his children are also become orphans. that is why young generation from many places of India joins militants Group so that their NoK's are safe with lavish life style not like foujis. We proud of you and I salute to Mahesh Bhai Savani. Firstly I appreciate his genuine intention. But I can not share 'THE JOY OF GIVING' with him. The regt/org or the def min for that matter, supposed to take care of the deceased family. If the concerned people ensure that families get the ex-gratia in time that is more than enough. Secondly, when a NGO or a generous individual take such steps, the Govt fail to react & take back step. further it sends a wrong msg to the society & it may not go down well with every soldier. It's a great rememberable gesture. A very noble deed indeed Mr Mahesh Sevani. Hope this gesture is seen by other CEO's. I congratulate MAHESH BHAI SAVANI for his big heart.My salute to this great man who realize the need of the great heroes ,those who gave SUPREME SACRIFICE for our country. Please publish his address and e mail.We can least send our greetings and gratitude. May god bless him and shower him with all the prosperity. can the Ambani 's/Tata 's/Birla's or the likes can promise jobs to atleast one such child after their completion of education .that may not a less than a noble cause to help the families to stand up on their feet at the earlist. never. their system doesnt have memory power to store such destitutes details for future course of action. 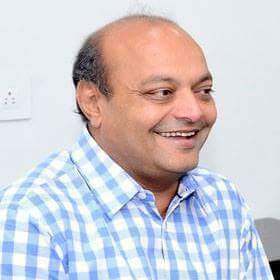 My heartful thanks and great salute to Mahesh Bhai Savani Ji, May God Bless You and your family members. I am R.K. Govindarajan Ph.D pursuing Periyar University Salem. Tamil Nadu. I need in your help in my educational carrier, present now i cant able to pay the tuition fee and Hostel fee kindly request to you help me sir.